Security software of one kind or another is widely regarded as a necessary evil for PC users. I remember, back in the 90s, trying out various AV solutions that had a terrible impact on my PC's performance. Things seem to have got better over the years with systems having so much more processing horsepower, lots more RAM, much faster storage and so on. Nevertheless these security suites are still using your machine's processing time – and your time – to do their checking, monitoring and updating activities. A company called AV Comparatives has recently published a document (PDF) which compares 20 of the most well known security software solutions. The firm uses its own mix of system tasks combined with the PC Mark 8 Pro testing suite to measure the impact of AV suites on a fairly typical PC system. The system under test was an HP branded PC based around an Intel Core i5 machine with 4GB of RAM, a mechanical HDD with Windows 8.1 64-bit installed, and an internet connection active. The AV-C score tests a PC system and measures its speed at file copying, archiving and unarchiving, installing and uninstalling applications, launching applications, and downloading files. File transcoding tests of previous years were dropped this year as the researchers thought them to be irrelevant. 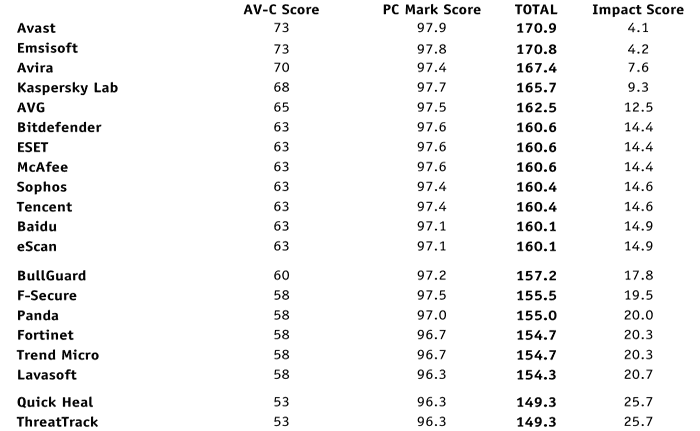 As mentioned above, these scores were combined with PC Mark 8 Pro results to create a new impact comparison score. The baseline system with no security software running (not even Windows Defender) was given a PC Mark Work score of 100. You can see every AV solution has an impact of at least a couple of points on this result. 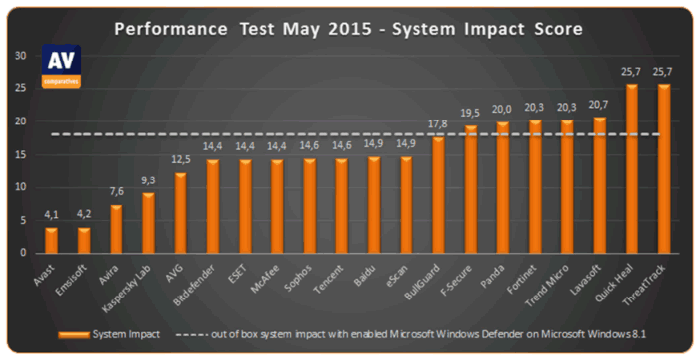 With the tests in its back pocket AV Comparatives asserts that the best solutions, in terms of having the weakest impact on your PC's overall performance is Avast, followed by Emsisoft, Avira, Kaspersky and AVG. The worst performers under its assessment regime were Fortinet, Trend MICRO, Lavasoft, Quick Heal and ThreatTrack. Microsoft's own Windows Defender product was very much middle of the field. A very important feature of the security software products not in the scope of this AV Comparatives comparison is – how effective these products are at their job. However the same company does other AV product test research and you can look up Real World Protection and File Detection tests and consider some of the findings there, if you are thinking about switching your AV solution, for example. Makes me glad I've used Avast for the past 3 years (for free too). Though my low powered chromebook (compared to my R9 280x equipped pc) is much faster when it comes to web browsing. If windows didn't dominate the games industry they'd be dead. huh, just yesterday I dropped my free version of avast and went back to windows defender ‘cause it seemed like avast was bogging down my laptop performance. after seeing this, i don’t know what to think… i'll wait a few days before deciding if i should switch back again. I bet they didn't bother testing Norton as it would have scared the jewels out of them! Security software of one kind or another is widely regarded as a necessary evil for PC users. I remember, back in the 90s, trying out various AV solutions that had a terrible impact on my PC's performance. Linux+ClamAV - don't even notice it's there. Actually the only security software that does make it's presence felt are the various browser plugins (like ABP) that I use. (Yes, I know it's a cheap shot, but I don't feel up to anything more strenuous at the moment). If windows didn't dominate the games industry they'd be dead. I think you misspelt “corporate enterprise”.